At this time of year with the holidays quickly approaching, I try to be as healthy as I can be on weekdays, especially at lunchtime. Following the 80/20 rule (80% eating healthy, 20% eating what you want) is always a good approach for maintaining weight and good health. Healthy entree salads fit into the workday beautiful–either packing it up at home and bringing to work in a Tupperware (dressing on the side), hitting a local salad bar, or ordering in a restaurant. There are so so many variations you can try, and feel good about your choices. Look for an upcoming post soon on some of my other fave salad options. This particular combination has become my go to for lunch these days. And I actually use (gulp) a bottled dressing I found at a local grocery store called “Pine Club” House Dressing. It’s sold in grocery stores in the Ohio area, but you can also order it online here. It’s a classic vinaigrette with a touch of sweetness that really compliments the salty feta. Escarole is one of the most underrated and underused greens. It’s a go-to for cooked or soup greens but not used raw enough. I love using the inner, light green, more tender leaves in salads and saving the outer, dark green, thicker leaves in soups (like Italian Wedding Soup, for instance.) 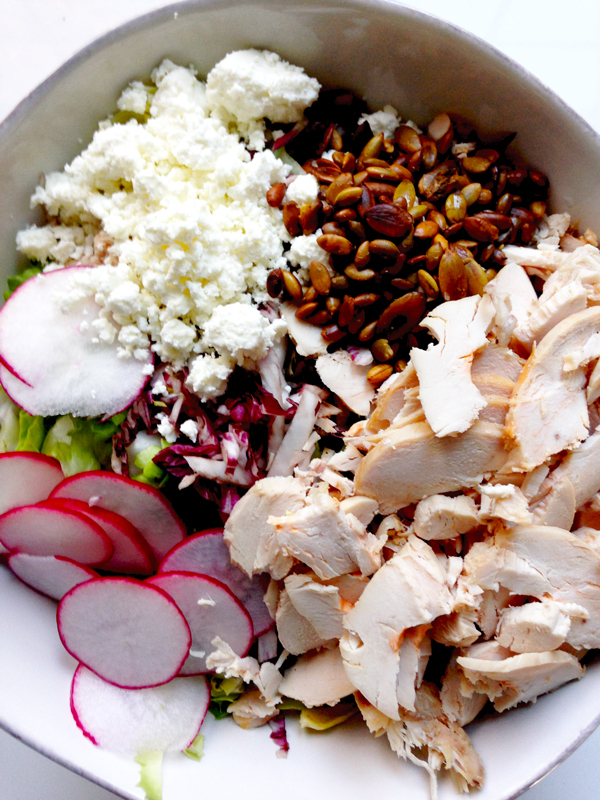 In this treatment, the inner leaves are chopped into bite-size pieces, alongside sliced radish, sliced radicchio, crumbled Greek feta, sliced grilled chicken, and quick olive oil-roasted and salted pumpkin seeds. The combination with the slightly sweet Pine Club dressing checks off all of the satisfaction boxes of crunchy, salty, sweet, tangy, bitter, and smoky. (Note: if you’re not able to locate Pine Club dressing, you could mimic the dressing easily with an apple cider/canola oil/sugar/salt/garlic vinaigrette like this one. Serves 2 entree size salads, 4 side salads. Chop escarole and radicchio into bite-size pieces, rinse thoroughly under cold water, spin dry. Add all ingredients except for pumpkin seeds and dressing to bowl. Pour on dressing to taste, thoroughly toss together, add a pinch of black pepper, and toss together again. Serve salad into serving bowls and top with pumpkin seeds. Enjoy.